On October 23, TeraThink is returning to Virginia Tech to speak to the Thrive Living-and-Learning Community. Several members of our team are participating on a Career Panel to share with students their career experience while at TeraThink. Having recently graduated from Virginia Tech, I wanted to share my thoughts on why I decided to join TeraThink after graduation. 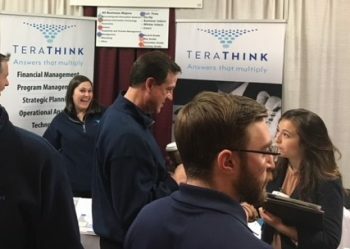 I first heard of TeraThink when I attended the University’s career fair this past January. As a second semester senior about to enter the real world, I was anxious to land a great job before graduation. In my search, I wanted to pursue a career that would allow me to continuously grow in a challenging environment and problem solve through creative thinking. I was immediately taken with TeraThink’s passion for the work they do and the clients they serve. From my initial meeting with the recruiters and executives, to my interview, not even 3 days had passed to when I received my offer of employment. For a college student undergoing rounds upon rounds of interviews with other companies and agencies, TeraThink’s quick turnaround was refreshing. Fast-forward several months into the job, I can say that choosing to start my career with TeraThink was the best decision I could have made. There are five things about TeraThink that prove it’s the right choice for me. These helped me make my decision to join their team of talented and driven individuals.